The Antique Barn by Bonnie Fisher comes in size 16 x 12. It has a lightly distressed frame, black with stained edges, no glass. This item ships from our supplier in 2 to 3 weeks in the continental United States. Thank you for choosing to shop with us and considering this beautiful print, Antique Barn Framed Art by Bonnie Fisher! 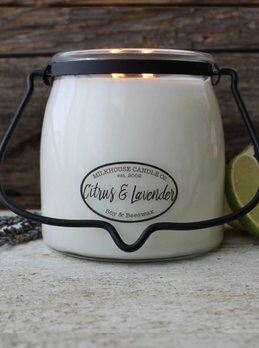 Fill any room with the scent of the Milkhouse Citrus & Lavender Butter Jar! You'll love the clean, tart citrus notes combined with fresh fields of lavender buds. Soy wax infused with beeswax has double wicks, 60 hours of burn time & 100% paraffin-free! Pumpkins by Bonnie Fisher comes in size 16 x 12. It has a lightly distressed frame, black with stained edges, no glass. This item ships from our supplier in 2 to 3 weeks in the continental United States.